Although I’ve worked with both boys and girls alike, I have a special affinity with young women between the ages of 12 to 21. These years are very impressionable and set the stage for future endeavors, which brings me to the creation of vision boards. 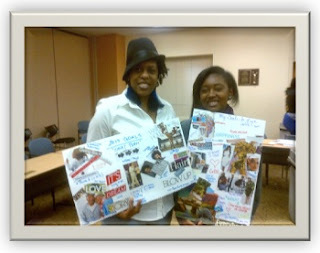 This activity was an excellent way to get the young ladies (and mentors) to think about their “short-term goals” and make them plain by placing visuals on their boards to represent the goals they plan to achieve for the year 2013. This exercise helped us to pin point some things we wanted to focus on and work towards achieving. It also allowed us to examine if what we were imagining was doable within the next 12 months… I must say, I really enjoyed the process myself. It gave me the opportunity to think about my own goals as well as talk with the young ladies and share our visions for what we plan on doing for this year. Once the task was complete, everyone had a chance to go before the audience and discuss their individual goals, utilizing their vision boards as a visual representation of their aspirations for the year. This gave the young girls the freedom to express their visions and speak their visions into existence as many of them took pride in doing so. I noticed quite a few of them became excited about their goals and began to speak with power as they presented them, taking pleasure in their creation and exuding enthusiasm in the possibilities... This is the magic that comes from creating vision boards… It’s not enough just to speak your goals; they become more powerful and impactful when you write them down. And adding visuals to the written word builds a sense of “I Can Do This” because you can now see it on paper, which makes it authentic.